As the tweets and facebook status updates rolled in this morning about how awesome everyone's long Memorial Day weekend was, I decided to look forward to this beautiful Tuesday rather than dread another week. After all, it is already Tuesday, and we all have an amazing weekend to be thankful for. Like my friends in the social media world, my weekend was full of fun, too. The weather here in Connecticut was questionable on Saturday, but apparently many people had the same idea with the rain pouring down outside and January temperatures causing thermostats to be cranked up. I heard on the radio on my drive to work this morning that us Americans broke the record for movie ticket sales this weekend! Well, I was right alongside my fellow Americans at my local movie theater seeing The Hangover 3. What did you all think of it? I've heard mixed reviews, but my opinion stands that the first movie in a series is always the best. Don't you agree? Sunday and Monday consisted of significantly sunnier weather and party hopping. My highlight was seeing my favorite little toddler turn two! 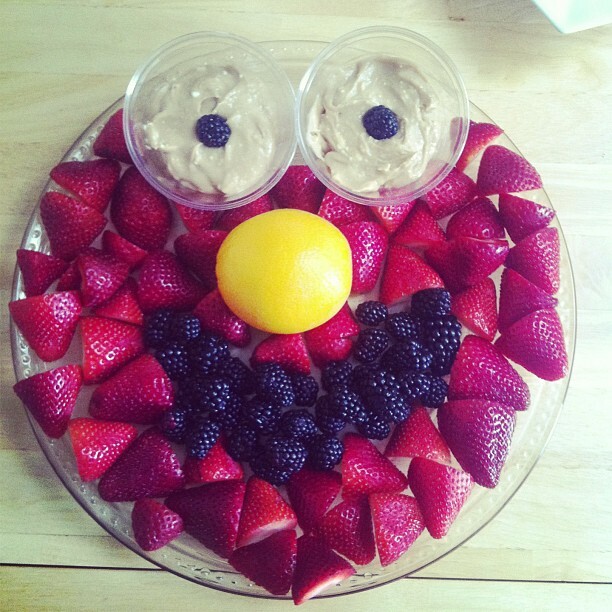 He loves all things Elmo and all things fruit, so I made an Elmo fruit platter. Needless to say, there was a strawberry in his mouth within seconds of me setting foot into his adorable Elmo party. Today was his real birthday, and so we spent the morning at the playground and got lunch, complete with milkshakes, at Bilda Burger in Woodbury, CT. Such a neat place. Hope you enjoyed your birthday, little man. Thanks for brightening my day, everyday.